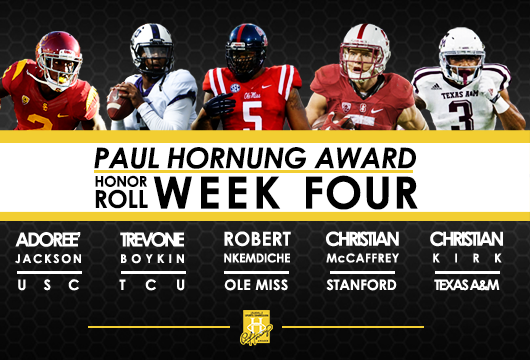 Louisville, KY – Monday, September 28, 2015 – Three offensive skill players and two defenders who contribute on offense and special teams earned the Paul Hornung Award Honor Roll exemplifying their versatility on the field. The five combined for 1,270 all-purpose yards and accounted for seven TDs and a PAT three different ways – receiving, rushing and passing. Quarterback Trevone Boykin (TCU), cornerback Adoree’ Jackson (USC) and wide receiver Christian Kirk (Texas A&M) are newcomers to the Honor Roll, while running back Christian McCaffrey (Stanford) and defensive tackle Robert Nkemdiche (Ole Miss) made the list for the second time this season. All five played big roles in their teams’ conference victories over the weekend. The Paul Hornung Award, presented by Texas Roadhouse, is awarded annually to the most versatile player in major college football. The winner and his family will be honored on February 25, 2016, at a banquet presented by KentuckyOne Health at the Galt House Hotel in downtown Louisville, Ky.
TCU quarterback Trevone Boykin led the Horned Frogs to a 55-52 shootout win at Texas Tech by amassing 527 yards of total offense as he ran, passed, caught a pass and punted the ball. Boykin threw for a career-high 485 passing yards and four touchdowns, ran the ball 14 times for 42 yards, punted once for 18 yards out of the shotgun formation, and made a circus catch just inside the end zone for a two-point conversion in the fourth quarter to give TCU a three-point lead. He currently leads the nation in total yards per game. Ole Miss defensive tackle Robert Nkemdiche continued in his two-way role as a stalwart and active defensive lineman, and a reliable scorer, leading the Rebels to a hard fought, 27-16 win over Vanderbilt. He had four tackles, including one tackle for a loss of three yards, and one QB hit on defense. On offense, he ran the ball in from the one-yard line to put the Rebels up 20-13 at the end of the third quarter in what proved to be the winning score. Through four games, Nkemdiche has two rushing touchdowns and a 31-yard catch for a touchdown. He is on the Honor Roll for the second time this season. USC cornerback Adoree’ Jackson showed his athleticism and versatility by playing cornerback on defense, wide receiver on offense and running back punts in the Trojans’ 42-14 win at Arizona State. On USC’s second offensive drive, Jackson turned a short pass from QB Cody Kessler into an 80-yard touchdown reception to put USC ahead 7-0 and into a lead they would never relinquish. Jackson also returned two punts for 53 yards and had two tackles. He finished the game playing four snaps on offense, 48 on defense and nine on special teams. Texas A&M true freshman wide receiver Christian Kirk racked up 255 all-purpose yards and caught the game-winning touchdown in overtime to lead the Aggies past the Arkansas Razorbacks 28-21 at AT&T Stadium. Kirk caught a 20-yard pass from QB Kyle Allen for the touchdown in overtime and the Aggies’ defense turned the Razorbacks over on downs to win the game. He caught eight passes for 173 yards, returned four punts for 77 yards and ran the ball once for five yards. Kirk now has three 100-yard receiving games in four games and is second in the SEC and fifth in the FBS with 201.25 all-purpose yards per game. Stanford running back Christian McCaffrey is on the Honor Roll for the second consecutive week after touching the ball four different ways and accounting for 303 all-purpose yards in the Cardinal’s 42-24 win at Oregon State. McCaffrey exceeded 100 yards rushing for the second consecutive game, gaining a career-high 206 yards on 30 carries from the slot, running back and Wildcat QB positions. He caught one pass for 38 yards, returned one punt for three yards and two kickoffs for 56 yards. McCaffrey leads the Pac-12 and is ranked third in the FBS with 222.25 all-purpose yards per game. 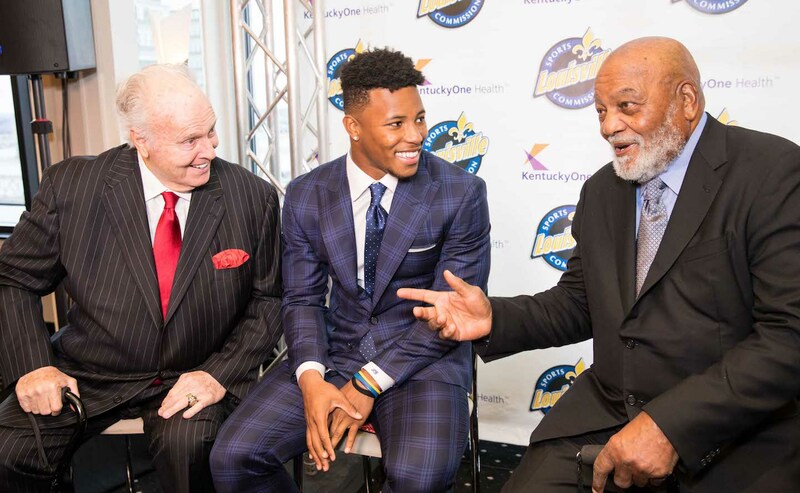 The Louisville Sports Commission successfully launched the Paul Hornung Award in 2010 to honor its namesake and native son, and to recognize and reward high-level achievers in college football whose performances and contributions as versatile players often go unnoticed. Owen Marecic of Stanford, a two-way starter and All Pac-10 performer at fullback and linebacker, won the inaugural Paul Hornung Award in 2010; Brandon Boykin of Georgia won the award in 2011 after excelling on defense, offense and special teams; Tavon Austin of West Virginia won the award in 2012 as one of two players in the nation with more than 500 yards in three different categories (rushing, receiving and kick returns); Odell Beckham Jr. of LSU won the award in 2013 after finishing the season ranked second in the nation and first in the Southeastern Conference with 2,222 all-purpose yards and 185.2 average yards per game; and Shaq Thompson of Washington won the award in 2014 as a two-way player, earning first team All-America honors at linebacker and finishing as the Husky’s second-leading rusher at tailback.